1. Make a video statement for #SaveNYC. No fancy equipment needed! Takes 5 minutes! Use your smartphone or point-and-shoot camera, upload to Youtube, and send in the link. Follow this link for full instructions on what we’re asking for. You can also add a photo with the #SaveNYC message, either homemade or our official logo. Tell your out-of-town friends and family to make videos for #SaveNYC. Make sure they tell City Hall that NYC is getting too boring to visit. They could stay home and go to Olive Garden and Applebee’s. City Hall doesn’t want to upset the tourists. 2. Send a daily tweet to the mayor, borough presidents, public advocate, and City Council members. Use the hashtag #SaveNYC. Find all their Twitter handles right here. What are you doing to #SaveNYC? Bring the Small Biz Survival Act to a vote. 3. Send an e-mail or letter to Mayor Bill de Blasio and City Council Speaker Corey Johnson. We’ve made it easy for you with pre-written emails. Just fill in some quick info and click “submit” — right here. FEELING MORE AMBITIOUS? READY TO GET OFF THAT COUCH? 1. Check the #SaveNYC Events page to find out what’s happening next. Click here. 2. Join the #SaveNYC Facebook page and be an active participant. Share ideas and strategies. Meet up with group members. Launch activities. Click here. 3. Attend a Community Board meeting in whatever neighborhood you care about and speak your mind. Bring a group of friends with you. Make some noise! Find CB meetings here. 4. Take #SaveNYC to the streets. 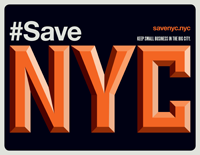 Make up some #SaveNYC stickers and stick them. Or use chalk — write #SaveNYC all over town. Find a way to spread the word.